It’s nearly summertime and there are few things that pair better with that summer heat than a cool glass of rosé! We teamed up with photographer Lauren Ross, designer Caroline Diani, and Sunstone Winery to put together this wine tasting day shoot inspired by all things sunny and summery! 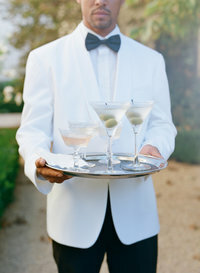 Our photo shoot was held at the beautiful Sunstone Villa, overlooking Sunstone Vineyards, in Santa Ynez. We created the shoot with the idea of a casual summer wine tasting day in mind! What is the best outfit to wear, which is the best wine to serve, what is the best snack to provide, and how do you display it all?? We’ve got all of those areas covered! With stunning pieces from DIANI Boutique, our girls were dressed perfectly for a summer day in sunny Santa Ynez Valley. We stuck to neutrals and whites to keep things fresh and elegant, while using light fabrics to keep everyone comfortable. The girls’ outfits were accented with some major statement pieces and they were set! Sunstone Winery has some of our favorite wines ever and what is better to serve on a warm summer day than a crisp glass of rosé?! We kept the wine light, just like the clothing! Chardonnay, Rosé, and Pinot Noir filled the beautiful glassware from DIANI Living and the party started! We wanted to provide some snacks for our guests that would give them something to nibble on while still being able to walk around the grounds. With beautiful white ceramic plates, antique flatware, and linen napkins all from DIANI Living, guests were invited to sample a beautiful charcuterie display from Seasons Catering. Our best tip with this is to have a range of options for people – choices of meat, fruits and crackers all in different colors to draw in your guests’ eyes (and stomachs!). And how could you leave out the cheese?! Seasons provided an absolutely stunning, three tier, cheese wheel cake for guests to add to their plates. Lastly, we wanted to tie everything together with some great decor pieces. We used the richness in the colors of the wine to inspire our table and floral design! We used indigo pillows and raw wooden benches from Found Vintage Rentals, while adding a few more indigo touches and accent pieces from DIANI Living. 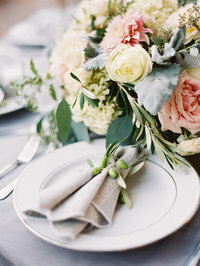 We incorporated blackberries and deep red roses into the flower arrangements to continue the rich, organic theme, while pulling in bright pops with coral peonies! We had Janice Blair calligraph our menu onto a matching piece of stone to bring everything back to the beautiful Villa that we were exploring! Whether creating your own at home or sharing a wine tasting day with friends, we hope this inspires you to share a glass of wine with friends today! 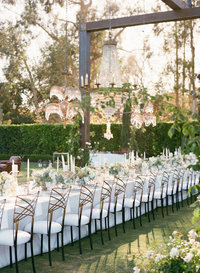 « San Juan Capistrano Wedding!